Bringing diverse cultural traditions into philanthropic fundraising can be rewarding for all parties involved. Accomplishing that daunting task successfully is the theme of this issue. Opening a constructive dialogue between theory and practice in philanthropic fundraising in diverse cultural and giving environments, editor Robert E. Fogal, executive director of St. Mary′s Duluth Clinic Foundation, is joined by contributing authors from the 2002 Think Tank on Fundraising at St. Mary′s College, Notre Dame Indiana. Exploring the topic from a variety of perspectives, editor and authors seek a set of normative recommendations and findings that will promote a stronger philanthropic community and extend professional, academic, and public conversations about philanthropic issues. Chapters examine trends in giving in African American, Asian American, Latino, and Native American communities. 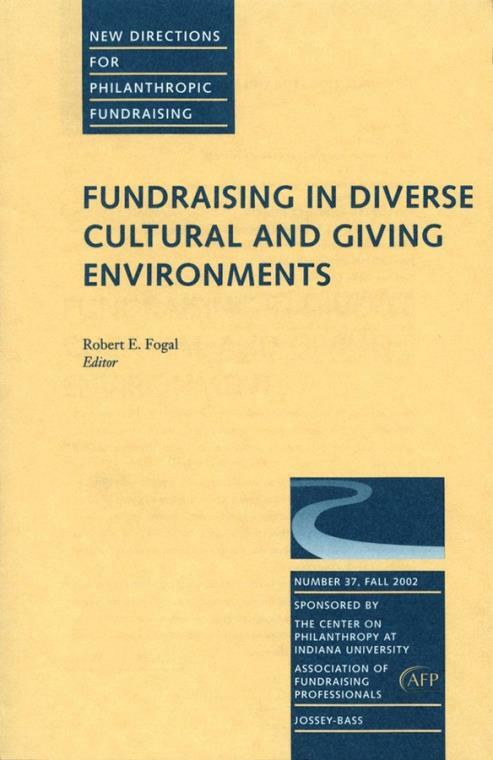 Pier C. Rogers presents the results of structured interviews with Africa American philanthropic professional managers, volunteer leaders, and fundraisers for nonprofits and provides insight into values, attitudes, and practices in this community. Janice Gow Petty addresses the theme of remittances in nonmajority immigrant families and explores ways that the majority culture can understand and engage this tradition to create new models of giving that successfully blend various and distinct methods of giving and sharing. Mike Cortes examines common assumptions about the "Hispanic" community and illustrates the more specific geographical identities in that diverse Latino community that supersedes the term. Similarly Kay C. Peck reminds fundraising professionals that there is no single American Indian culture and stresses the importance of recognizing the history of cultural destruction as a prerequisite to understanding philanthropic traditions within the American Indian community. Effects of race and gender on giving and volunteering are explored. Presenting the results of a survey of 885 Indiana households, a research team at the School of Public and Environmental Affairs, Indiana University – Purdue University Indianapolis examines these effects and tracks them across different survey methodologies used in eight past studies. Findings from this study bring to light significant, and surprising, trends in giving and volunteering behaviors by race and gender. Philanthropic fundraisers must also recognize emerging cultures. Working at the Community Foundation Silicon Valley, Barbara Larson explores the "new philanthropy" in the dot–com world, and reveals the breakdown of donor market categories in the face of the variety of options and vehicles for giving in this volatile, constantly changing donor community. Unexpected trends emerging in the wake of the Bush administrations′ initiatives to foster faith–based engagement in social welfare through government funding must be recognized as well. Director of Development for Catholic Near East Welfare Association Margaret Guellich examines some of the potential risks to mission integrity, stewardship, and donor erosion. Thomas H. Jeavons, visiting fellow at the Yale University Program on Nonprofit Organizations at Yale Divinity School, cautions against perceive faith–based organizations as monolith social entities and demonstrates that the impact of the proposed government program is likely to be small. What does the fundraising professional need to face these and other emerging challenges? Roger C. Hedgepeth, principal consultant for CWC/Hedgepeth Group, asserts that fundraising and fundraising professionals are not prepared to deal with the cultural and social changes they face. Instead, they need to become boundary spanners characterized by uncommon professional skills that are supported by keen self–awareness and multicultural literacy. This volume is a crucial tool for philanthropic fundraisers committed to achieving that goal. Editor s Notes (Robert E. Fogal). This overview of issues about inclusive philanthropy and suggestions for addressing such issues successfully is drawn from a study carried out for the Council on Foundations. Breaking the cycle of ignorance about how African Americans practice philanthropy will benefit the majority culture. Family remittances that sustain interdependence within families may provide a base for contributing to the larger community. The author addresses the problem of generalizing about Latinos and the diversity of giving styles among various Latin American immigrant communities. Stories shared in small group sessions help outsiders develop sensitivity to the values of a different culture. 6. Race and gender differences in philanthropy: Indiana as a test case (Debra J. Mesch, Patrick Michael Rooney, William Chin, Kathryn S. Steinberg). Research that controls for educational attainment and income level has found that differences in giving among diverse demographic groups are minimal. Venture philanthropists may be creating a new giving culture as they retain some traditional practices. Federal government money to faith–based nonprofit organizations may have effects on mission integrity and stewardship. Donor erosion may be another effect. The likelihood is that increased federal funding will have little impact on religious service organizations. What will it take to be a professional in philanthropic fundraising in an environment of diversity and inclusiveness?